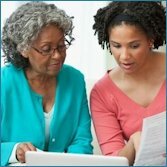 What is a Caregiving Plan? How do we make a Caregiving Plan? What do we need to think about when making a Caregiving Plan? A Caregiving Plan lays out what needs to be done to manage the health and well-being of the patient. Unlike the doctor’s “plan of care,” the Caregiving Plan addresses mostly non-medical issues. A Caregiving Plan can help you line up outside help ahead of time, avoid schedule conflicts, improve communication, and reduce caregiver stress and overload. Talk to the patient about the level of care he or she thinks will be needed. The person receiving care should have the biggest voice unless he or she is mentally or physically unable. Make a list of everyone who wants to help, including family members, close friends, health professionals, home care workers and others in the community. See the section below on areas you need to think about. Remember that the level of care needed can change. The person with cancer may only need help for brief periods of time like after surgery or chemotherapy. Or, he or she may need constant or almost-constant care. People who are not able to recover will likely need more help as time passes. Learn more about planning a family meeting. Make sure everyone has a copy of the Plan. Then check-in with each other regularly to make sure things are getting done. The care team should assign a point person for each area of care. This doesn’t mean that person has to do everything in that area—just that he or she is responsible for seeing to it that those tasks are done. As things change, be sure to update the Plan. Is the patient able to see and hear well? Does the person need professional nursing care to manage wounds, drains, catheters or other medical equipment? Does he or she have other diseases that need to be managed like diabetes, high blood pressure, arthritis or emphysema? What medication is the patient taking? Does the patient need assistance taking medication or remembering to take medication? Does the patient have any mental health issues like depression, anxiety or psychosis? Should he or she be seen by a mental healthcare professional? Does the patient have problems with incontinence (inability to control urine or bowel movements)? Can he or she move around safely and comfortable? Can he or she dress, bathe, shave, brush teeth, wash hair, use a toilet, and use the phone without assistance? Can the person get help in an emergency, shop, prepare meals, do housework, yard work, and/or drive safely? Does the patient have any eating issues? Can the patient manage his or her affairs, including paying bills? What is the patient earning and spending? What are his or her income sources (e.g. Social Security, pensions, salary, investments, etc.)? How long will his or her savings last? Are there any other sources of financial assistance? Where are important financial documents—like the car and home title and insurance policies—stored? What insurance coverage does the patient have? Medicare? Medicaid? Private insurance? Does the patient have long-term care insurance, supplementary insurance or life insurance? Does insurance cover "non-medical" personal care? Has the patient been told that insurance won't cover medical tests or procedures that the doctor has ordered? Does the patient have a will, trust, advance directive, or living will? Have they signed a healthcare proxy or power of attorney? Do the primary caregiver and/or caregiving team have access to these? What are the patient’s hobbies? Does he or she belong to a church or other faith-based group? Does he or she get out of the house for social reasons? Get visitors at home? Do family members live close by? Is there someone from the patient’s faith community that can drive them to services?